Hello, my name is Caleb. I'm 17, but I'll be turning 18 in a few months. I wasn't planning on joining the 501st until I started working on a EVA foam ROTK kit (obviously not for approval ) for the upcoming Cincinnati Comic Expo in September. But I realized how much I loved the whole armor building experience, even if it is just a EVA foam kit. Now I want to do it for real. I fell in love with the ANH kit after watching "Armor building with TK-1636". The only reason my EVA foam kit is a RO is because I have the Black Series bucket I've been researching all the different kits and the ATA one caught my eye, but I can't figure out how much it is... do any of you know what their current pricing is? I need to find out so I can start saving for it. I would also like to know if anyone has been able to successfully take apart a Black Series TK bucket? I was planning to wait and mod it before I put it together, but couldn't resist not putting it together when I got it. Now I can't get it apart! Sorry for the large barrage of questions. Thank you in advance for any replies! Welcome to the FISD, Caleb! Those are some great videos - good for you for finding them, they will help. Hopefully the contact info for ATA is good and you can get a price. If not, just ask around here, someone will know another way to contact them if needed. 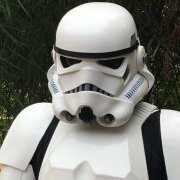 Keep in mind that the R1 Black series helmet will not be approved with your ANH TK - if that was the intent. There is also a whole section here devoted to people's builds - the better ones act as excellent step by step tutorials on how to build your TK. You'll want to check out a few of those for sure. Best of luck in your TK journey! Thank You! So all I need to do is Email ATA. I couldn't see any off the pics in the R1 helmet Mod thread. Could it be because I don't have a Photobucket subscription? The R1 helmet is just for my EVA foam R1 kit. Thanks! I've been wanting to sign into the forum for a long time! I'll post a build thread as soon as I can. I still need to save quite a bit for the armor. In the meantime, maybe I could get some of the soft parts and use them for my EVA foam costume. I was going to have it a completely R1 suit, but I don't think anybody will care if I have ANH boots, undersuit, ect. Welcome. You came to the right place for help. The Armor Building videos TK-1636 has done are absolutely fabulous, and informative. I would watch them as I would get ready to do whatever section I was working on and they helped me tremendously. Hi Caleb . Welcome and best of luck on your TK journey. I have no experience with the black series helmet but I would say you are going to end up wanting to buy a helmet kit instead of modding the black series helmet. I bought an EFX helmet back before I bought a costume and thought I could use it. Found out I had to pretty much tear it apart and patch it up again to get it sort of correct. Wasn’t willing to take the risk and just kept it as a nice display piece. TK -1636 videos are awesome. Additional WIP threads for build reference can also be found here. screen references can be found here. Consider EIB and Centurion levels from the start. It’s worthwhile and plenty of folks to assist. Welcome to the FISD Caleb! Welcome! You’ve got tons of info here so soak it all in and figure out which way you want to go. This isn’t a race so there is no need to rush to a decision. Welcome aboard Caleb! Yes I will always suggest Mike's videos for those interested in videos. He was quite helpful in my build. Here on the forums there is a wealth of information and collective wisdom to be learned from. I'm kind of conservative when it comes to spending money. I still have doubts of whether I should do this or not, when I look at the prices of all the different armor kits. I wanted to find a middle ground between quality and price. I assumed since ATA stands for Affordable Trooper Armor, that it would be on the less expensive side. I still need to email them. Another thing is that I'm also involved in some American Civil War reenacting. I wasn't sure if I could afford TWO expensive hobbies. I've wanted to join the 501st ever since I first found out about you guys. The Stormtrooper was always my choice costume to do. That's why I started making a EVA foam costume. I figured that I could make a cheaper non-approvable suit, and pretend to troop at conventions. Pitiful, I know I watched armor building with TK-1636 and read build threads to get myself inspired. I also decided to make a Rogue One kit (even though ANH armor is my favorite) since I got a Black series helmet to wear, instead of making one myself. Yosh's R1TK build was VERY helpful by the way. Thank you all for the kind welcomes, and advice! Goodluck on your journey ! Dont be be scared to ask questions! We love questions! Right here at fisd it’s all about troopers helping troopers !!! Lot's of other armor makers out there now compared to when ATA started, I went ATA because I believed it was middle of the road and was happy with the quality and price, it is also a lot thicker than some other armor and has done me well over the years, now taking me in to my 7th year of trooping with only 3 cracks, 2 from overzealous luggage handlers when I travelled east for a Dreamworld event, and another in the corner top of one of the shins from the constant opening and closing. Thank you! That was really helpful. I started to get discouraged when I was researching Chelsea boots to paint. I read that you could save money by making a few of the pieces yourself. I'm no newbie to costume making in general. So I thought that I could find a pair of boots for $40 to $50 and paint it with some leather paint. But all of the boots I saw were more expensive than any ready to troop in boots out there. At least none of the boots available for EIB or centurion. I've seen a few paint boots themselves but the paint will crack and come off over time, using leather dye seems the next best option but then it starts going up in price. You can find a lot of boots on eBay but look closely at the inside areas of the boots, (many won't add that image so you have to contact and ask for it), as most of the cheaper boots have a join line on the insides, which will not meet L2 or L3 requirements. I have TK Boots but unfortunately they are no longer making them (although they still have a few odd sizes left) Imperial Boots would be my next call if I needed replacements. My TK Boots have are still going great after 6 years of trooping and a lot of walks, from what I heard Imperial Boots are of the same quality so you won't be disappointed if you purchased from them. I was told that industrial acetone wipe would help the keep the paint from chipping off. It helps with the adhesion of the paint. Chips and flaking are screen accurate as the same process was done for the screen used costumes. I guess I will keep looking for a accurate pair of boots. I'll consider getting a pair from IB if I can't find anything. I think I heard somewhere that you could join the 501st as a handler if you didn't have a costume yet. Is that true? If so, then maybe I could join and get acquainted with the other members in my garrison. It can be very helpful joining your local garrison's forum many have armor build days which you may be able to attend and see first hand how building is down and different armors close up, some garrison's also have recruit programs which will also be of great help.